Below are some of my favorite spots in Nashville. They're established local places that I visit frequently and highly recommend. Obviously, I couldn't include everything the city has to offer, but if you think I've missed something amazing, feel free to email me. Hot chicken is a Nashville must and this is the original!! Honky Tonks Broadway / Robert's is my favorite! Jackalope / Rompo Red Rye Ale / The first female-founded brewery in TN! This boutique hotel in the middle of the Gulch neighborhood. The property is new and modern with mid-century touches and a relaxed luxury. The rooftop bar, LA Jackson, offers great views of the city, and John Besh's Marsh House serves seafood and Southern cuisine. Noelle has a long history in Nashville. Originally built as a hotel in 1930, the historic building was mostly been used as an office building until it reopened after a major renovation in 2017. Utilizing local artists and craftsmen, Noelle balances it's historic base with modern touches seamlessly. If you're looking to stay downtown and want a cool vibe, 21c is a great option. The hotel, just a few blocks from lower Broadway, is not just a place to stay - it's also a curated art exhibition. The rooftop suites with outdoor terraces are a great place to hang out and Gray & Dudley offers seasonal comfort food. Midtown's newest boutique hotel has an industrial chic vibe that is great for both leisure and business clients (lots of great meeting spaces). The location is perfect for hanging out with locals and their restaurant, Henley, serves delicious food (I loved the duck!). If you want a bit of old-world glamour, the Hermitage is Nashville's oldest hotel. It's certainly more traditional but the downtown location has great views of the state Capitol. Booking a stay with a Virtuoso agent (me! ), you will get a $100 credit to spend on property, and daily breakfast in the Capitol Grille (check out the art deco men's room). This is probably the most well located hotel for exploring downtown Nashville. It's a mere two blocks from Broadway, across the street from the convention center and connected to the Country Music Hall of Fame. Part of the Autograph Collection, Union Station Hotel is housed in an historic stone building that was once a train station. The hotel is conveniently located next to the First Center for Visual Arts and is a quick walk or cab ride to lower Broadway, the Gulch and Midtown. For a small, local experience, book a room at the cute and charming Germantown Inn. The old meets modern aesthetic works perfectly in this six room hotel and the location is perfectly situated on a quiet neighborhood street. Music lovers call it the Mother Church for a reason! Seeing a show at the former home of the Grand Ole Opry is a must. The best thing about music in Nashville is that you can find it for free any day or night of the week. My favorite Honky Tonk is Robert's, but Tootsie's, The Stage, Legends Corner and Second Fiddle are all fun. The Station Inn is a legendary Bluegrass venue in the Gulch that has survived the modern expansion of the area. This famous singer/songwriter venue is unassuming in a Green Hills strip mall. But don't let location fool you - it gets its fair share of powerhouse musicians. Jack White's record store is also a live music venue worth visiting. The home of the Nashville Symphony is not only a great place to hear classical music, but also a great venue for contemporary musicians, comedians and movies accompanied by the orchestra. Tribe, Play and Canvas are all within walking distance and each offers something a little different. The drag show and dance floor at Play are super fun. Fun bar and lounge offering great karaoke and people watching on the East side. This monthly Queer Dance Party brings great dance music from La Force. Directly downtown, this outdoor venue is the perfect spot to sit on the lawn and listen to great bands. Home of the Nashville Predators (and occasionally a big show)! Home of the Tennessee Titans (and occasionally a big show)! The museum of art is located in an historic Art Deco building that was once home to Nashville’s main post office. While in Music City, you should definitely visit the exhibitions at the Country Music Hall of Fame, which also offers fun educational programs. Yes, Nashville has a full-scale replica of the ancient Greek Parthenon as the centerpiece of Centennial Park. The building also houses an art museum and a 42-foot statue of Athena. 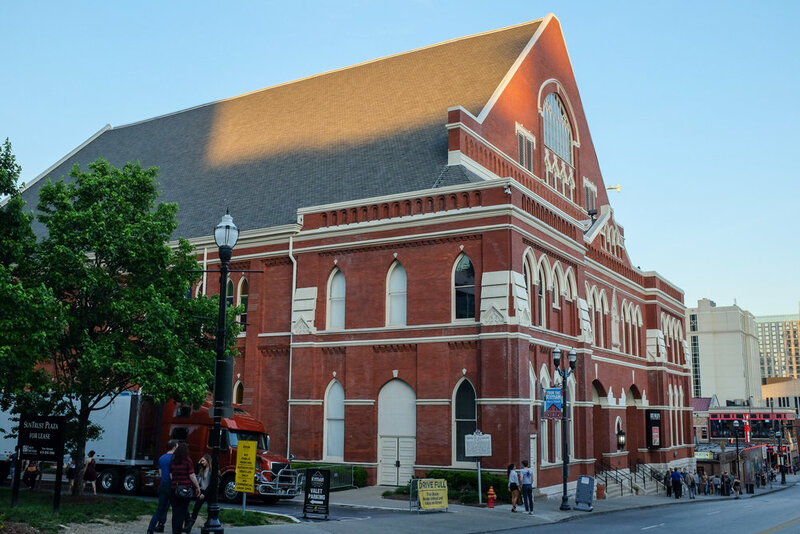 If you don't get a chance to catch a show at the Ryman, you can still get a backstage tour to see where legends like Johnny Cash have played. The Jugg Sisters take you on a musical tour of Nashville in the comfort of their hot pink bus. It’s tacky in the best possible way! This intentionally kitschy show at the Station Inn is a great parody of country music duos. If you're a fan of Johnny & Patsy, you should visit these two museums that chronicle their lives and careers. Though housed in the same building, the tours are separate and take about 45 min each. The rapidly expanding zoo has a focus on conservation and features threatened species like the clouded leopard. The botanical gardens and rolling grounds are a great setting for guest sculpture installations from the likes of Dale Chihuly and Jaume Plensa. The best view of the Nashville skyline. It’s also a great way to get from downtown to Nissan Stadium for a Titans game. The hills of Percy Warner Park are great for hiking and cycling (park at the Allee at the end of Belle Meade Blvd) and the typically flat greenways throughout the city are nice for a casual stroll or run. The Parkway is part of the National Park Service and is a favorite route for cyclists and motorists alike. The north end of the Parkway is on Hwy 100 near the Loveless Cafe. Located in the Country Music Hall of Fame, this letterpress shop is famous for its music posters. Cute, quirky and affordable prints. You should also check out their other art related services and public art projects like Our Town. If you want a rhinestone cowboy ensemble, look no further than Manuel. For cowboy boots, the shops on lower Broadway almost always have a special offering. Ann Patchett's independent bookstore in Green Hills is a great reason to pick up an actual, physical book. This vibrant, walking-friendly neighborhood is great for shops like Imogene + Willie and Reese Witherspoon's Draper James. Handmade leather goods and (not cowboy) boots in East Nashville.